Physical characteristics: The blue-gray gnatcatcher measures 4 to 4.5 inches (10.2 to 11.4 centimeters) long and weighs 0.18 to 0.25 ounces (5 to 7 grams). Bearing a long, thin bill, it has a blue-gray back, a white underbelly with buff sides, a buff colored face, and a long upright tail that is white on the outer edges and black on the inside. When the male breeds, it has a black eye ring; otherwise, it is white. 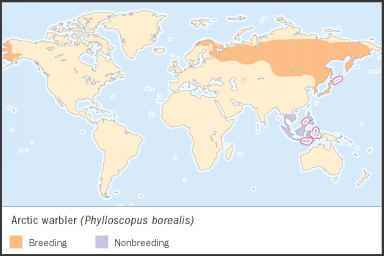 Geographic range: These birds breed throughout the United States except in the Great Plains, and many will winter in the southern United States, Mexico, Honduras, and Cuba. Some permanent populations exist in Mexico and the Bahamas. Habitat: The blue-gray gnatcatcher lives in the swampy underbrush and thickets of pine and leafy forests. In the western United States, these birds are found in arid scrub and stands of pinyon-juniper. In humid tropical areas, the birds will occupy the vine tangle of rainforest as well as thorn forests, scrub, and clearings. Diet: This species eats insects and spiders. The blue-gray gnatcatcher finds insects by diving for them from the air to the forest floor or catching them in the air. Sometimes, they will forage while sitting on a perch. Behavior and reproduction: These birds live alone or in pairs. Among migratory populations, males will stake out territory, singing loudly, well before the females arrive. Their calls are a thin whine. The male's is a series of notes, chips, and whistles. Birds of this species mate for life. The male brings his mate to a nest that they both build, made in a cup shape from grasses and spider webs, covered with lichen, and situated on high branches of trees or shrubs. 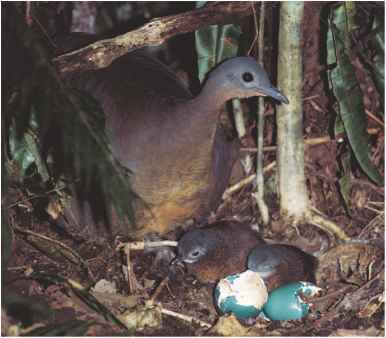 The female lays four to five pale blue eggs flecked with brown that are incubated for eleven to fifteen days by both the male and female. When the eggs hatch, only the female feeds them, but both parents will feed them when they leave the nest, usually in ten to fifteen days. Blue-gray gnatcatchers and people: Blue-gray gnatcatchers have no special significance to humans.